A new Norton Anthology illuminates how literature can build character and foster critical-thinking skills for future leaders in business, law, politics, medicine, and beyond. Rather than order selections by chronology, Samet puts great writers and thinkers in conversation. That structure enables students and teachers to focus on skills and characteristics that effective leaders cultivate. Samet's general introduction, "A Crisis of Leadership," section introductions, and discussion guides encourage critical thinking and classroom discussion. "This thought-provoking anthology, designed by a practitioner of the art of developing young men and women into capable leaders, isn't about how to lead, but how to think." 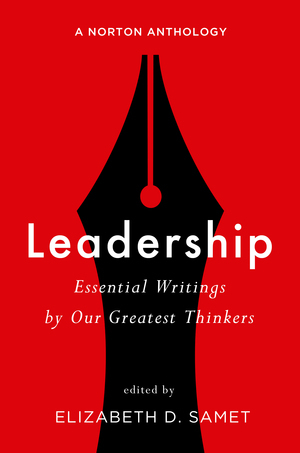 Leadership: A Norton Anthology can serve as a core text for courses focused on business, government, science, education, and more. The alternate Table of Contents organized by Field of Interest highlights the anthology's flexibility and amplitude.